The Yucatan Current is a flow of ocean water that plays an important part in the formation of the Gulf Stream, a concept with with most people are at least vaguely familiar with. What most people don't know is that the Gulf Stream is actually at the tail end of a larger flow system that begins off the coast of the Yucatan Peninsula. At this point there's a narrow gap between the southeastern tip of Cuba and Cancun, called the Yucatan Strait. Imagine this massive liquid highway coming form the coast of Africa that get's pushed into the Mexican Gulf through only a very small opening. It's like turning on a fire hose! But the water coming out of the fire hose does not go into free space. Instead, it encounters a womb-like enclosure with only one exit to the east. So this giant force pooring into the Gulf bassin has to bounce and, at some point, starts to rotate. A clockwise rotation like that is called a Gyre. 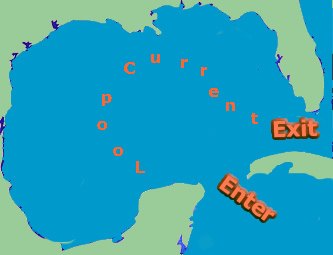 At this point the water highway transformes into the Loop Current and takes a right turn towards the Florida Strait on the eastern side. At the exit door it then becomes the Gulf Stream which in turn is responsible for the climate conditions of many Western-European countries. During it's rotation in the Mexican Gulf - mostly in the eastern part - the current "shakes off" many giant spinning water bubbles (like a dog shaking off water). These Eddies can be troublesome for the mexican oil platforms in the Gulf because of their inpredictability. Eddies are constantly monitored and when one gets to close the rig is shut down to prevent damage. Now this is a somewhat simple explanation coming from someone who's totally infamiliar with oceanography. In case you'd like to know more about these systems, here's a well-written article from NOAA's Research coordinator Steve Gittings about the Yucatan Current. He explains how these currents form and drag along life-forms from one point to the other.